Aunt Margie wasn’t just about delicious food. She also considered efficiency. When it was an oven cooked meal, like baked chicken, she would often prepare one of the side dishes to cook in the oven as well. This rich, buttery and nutty, chicken flavored rice went memorably well with her baked chicken. Although I have not included it in the list of ingredients, I have sampled this dish with pine nuts or slivered almonds for extra crunch, sometimes with garlic, and sometimes sprinkled with a bit of fresh grated Parmesan cheese just as it comes form the oven. A great dish for the Italian-themed dinner. All are equally good. 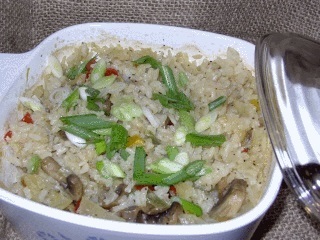 Cover rice in cold water while preparing the vegetables. Before cooking, drain rice in colander and leave to drain awhile before sautéing with the rice and vegetables. Heat butter and olive oil over medium heat in a large skillet. Add rice and onions. Fry and stir until onions are soft and rice begins to brown. Add mushrooms (if fresh) and cook until mushrooms are tender. Add chicken broth and water until heated through. Stir in mushrooms (if canned) red and green Bell peppers. Pour into a 6x6x3-inch casserole dish with a cover (a dish with clear glass cover to check the liquid level is nice here). Cover and bake in a preheated 350°F oven for 25 to 30 minutes or until all the liquid is absorbed (Poke with fork - no liquid left on the bottom of the dish). Remove from oven, remove cover and allow to sit 10 minutes, fluff with fork, garnish with sliced green onions and serve.